Hello Angus! Aren’t you just a cutie? I love your nose and mustache. I came across the most adorable gnome on Pinterest and I just had to have one for myself. Check him out. He is just full of adorableness. She used a pattern from another Danish blog. Once upon a time I Google translated the pattern since it was not available in English. However, Google translator isn’t the best when it comes to translating things like crochet terms, so even after I translated it there was still a lot of deciphering to be done. 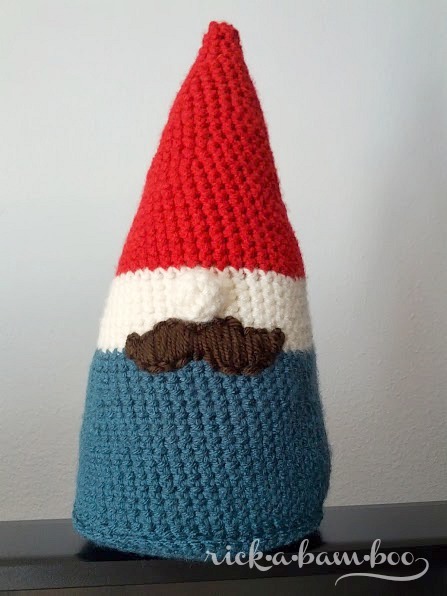 Now that I’m ready to make this gnome I can no longer find the post with the pattern in it, so I made my own based off what I remember and my own crochet knowledge. If you make up your own gnome, I’d love to see it! Let’s hook up on Ravelry. Get it? Hook up? Crochet? Okay I’ll stop. Fasten off with a long tail. Use tail to stitch nose to the face. Fasten off with a long tail. Use tail to stitch bottom to the body. I completed the main part of the gnome (the hat, face, and body) and stitched my mustache on before stitching on the nose or bottom. For the mustache I cut one out of some brown fabric that I had and tacked it on to my gnome where I wanted to stitch on the mustache, so that I had a shape to follow to try to make it as even as possible when I stitched it on. Then I just stitched over the fabric, so there’s a fabric mustache hidden in there somewhere. After I had stitched over the fabric mustache, I back stitched around it to make my edges more clean. 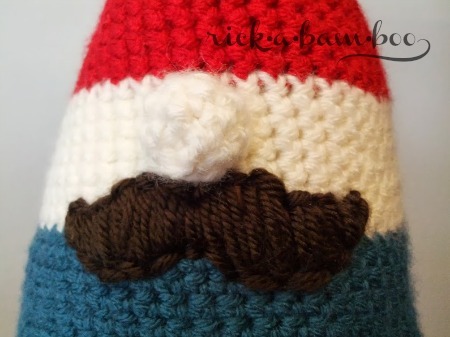 Once I had the mustache on I stitched the nose on, stuffed my gnome, and stitched the bottom on. Done! There really is no gauge for this project. The finished size will depend on how tight your stitches are and the type of yarn you use. I used Hobby Lobby’s I Love This Yarn acrylic (my favorite) in red, ivory, antique teal, and coffee. 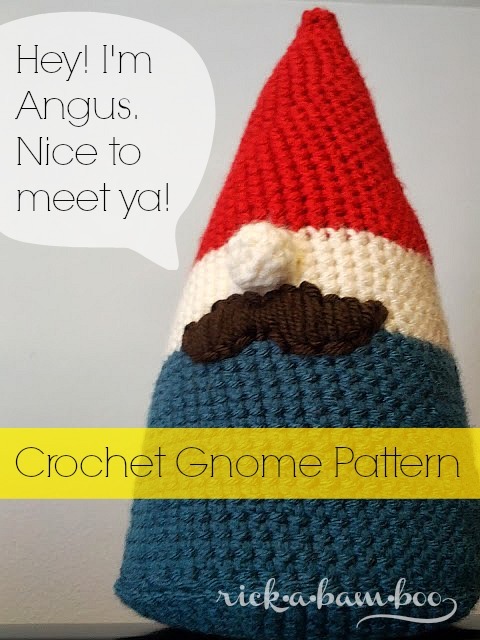 Angus ended up being about 11 inches tall and 5.5 inches wide. I love him and I think Thor will too. « Online BlogCon 2013 Is Coming! SO cute! Teach me to crochet! This is So super cute, makes me want to learn how to crochet! Thanks so much for sharing! I’m on a very limited budget and free always will fit into it! Bless you! I’m so glad you figured out this pattern for me! I’m always frustrated when I find cute pictures on pinterest only to find that the actual pattern isn’t available. Not that this is super complex, but you definitely did the hard part for me and I appreciate it. I did tweak your pattern a little though because I didn’t see a need for making a separate piece to sew on the bottom. Granted it probably makes stuffing easier, but I decided to start with the bottom and work my way up. After round 11 of the bottom, I went straight to round 55 of the body working in back loops only to make it turn. I think it worked out pretty well! I also added a circle of thin cardboard inside before stuffing it, just in case it needed help standing. I’m not sure it did though. Now I’m thinking about altering the pattern a little to make different sizes. Thanks for sharing Angus with us! (Love the name too! hehe). Oh, I was also thinking (since it’s almost December) that this could easily be a Santa thing. Not that we need more santas, but black bottom, red hat, maybe a gold buckle instead of the mustache. I like the abstract representation. The bottom up is definitely another great way to do it! That didn’t even occur to me. I think he would make a great Santa and make a few smaller elves to go with him. Love it! Hi. Very cute gnome. I have a blog in french and I will be very happy to propose this pattern. Could I translate it in french and publish it on my blog? Thanks for sharing! I love gnomes! When you crocheted the rounds did you slip stitch into the beginning of each round? No I did not. I just kept going around to make it as seamless as possible. How die you make The nose? The pattern for the nose is listed in the post. Right below the body pattern. Thank you for the pattern. I fell in love with last year and finally made him. I called mine Argyle! He’s adorable! Looks like Mario and Luigi’s grandpa. I’ll be making him and some brothers soon. Hmmm…maybe some sisters, too. Without the ‘stache. Tnx for sharing the pattern! I just have the bottom and the nose left to make. Now I wounder how you make the mustashe? Hello! I am glad that you like him. I just cut a mustache out of brown fabric and glued it on. Then with brown yard I stitched over the fabric and outlined the whole thing. I love how he turned out.